FoodTech Barcelona is the food industry’s most innovative and inspiring exhibition dedicated to bridging the gap between food processing manufacturers and companies. The eventful 4-day exhibition held at the Gran Via Venue took place from 8th – 11th May 2018, and facilitated the global networking and interactions of professionals within the food machinery, technology and processing industries. 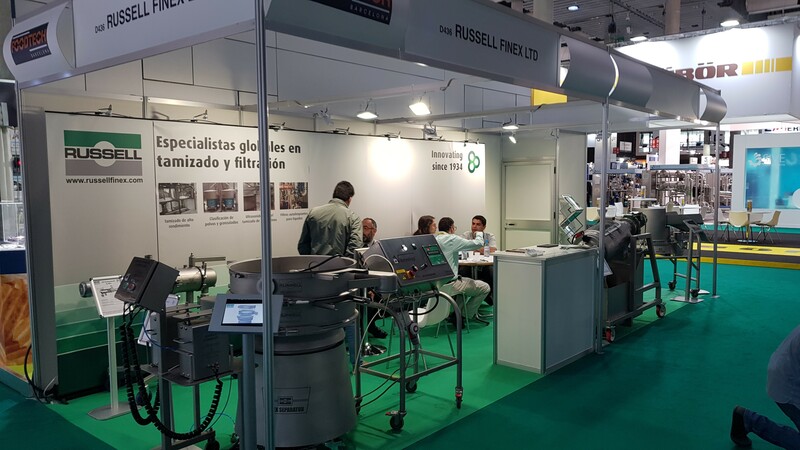 This is another noteworthy year for Russell Finex at FoodTech Barcelona, with high quality enquiries and connections being made. Russell Finex was located in Hall 5 Stand D436 with a range of innovative sieving and filtration equipment for the food and drinks industry. The Russell Compact 3in1 Sieve™- This safety sieving machine has been designed to aid food screening processes that require hand fed ingredients. The sieve is fitted with a magnetic separator which catches any metal contamination within the product, ensuring product quality. The Russell Compact Airswept Sieve™ - This vacuum-conveying sieve combines Russell Compact Sieve® technology with conveying lines for easy screening of powders and granules. This dust-tight check-screening operation increases capacity by up to four times when compared to standard vacuum conveying sieves. Vibrasonic® Deblinding System – This ultrasonic sieve accurately eliminates mesh blinding and blocking, common when sieving fine powders. The system increases screening capacities up to 10 times more, whilst reducing downtime and running costs. The Self-Cleaning Russell Eco Filter® – This self-cleaning filter has been designed for the sanitary requirements of the food and drinks industry, with the ability to remove oversized particles or contamination as small as 10 micron. The crevice-free design allows for a superior and faultless filtration and elimination of contamination. Contact us to discover more about the innovative range of sieving and filtration solutions available to improve your food and drinks processing and packaging requirements.